I peered out the window of the moving train to see the oddest sight: a jeep filled with ten, terribly squished passengers speeding past, its occupants smiling and waving at us. This was unusual mainly for the following reason: a jeep so laden down with body weight was still going faster than our train. 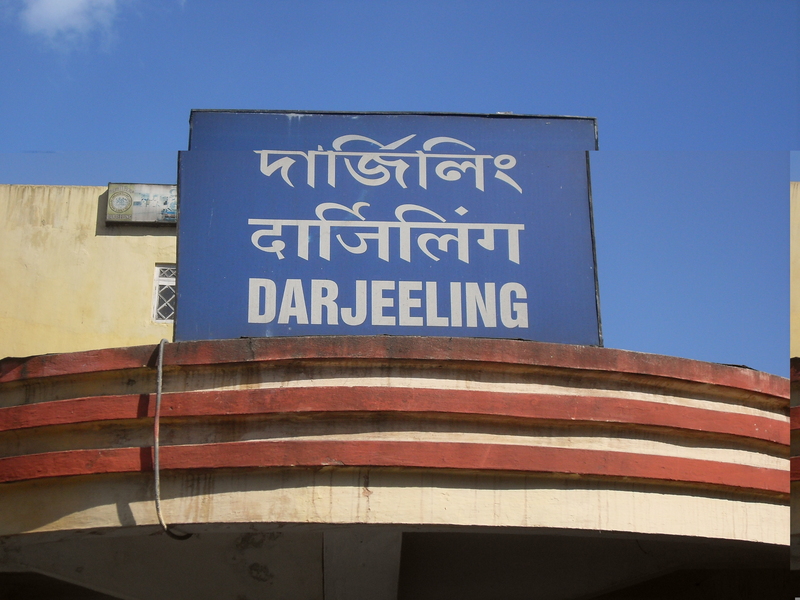 The boy and I had finally decided to say our goodbyes to Darjeeling, having had a wonderful three day break in the little town. 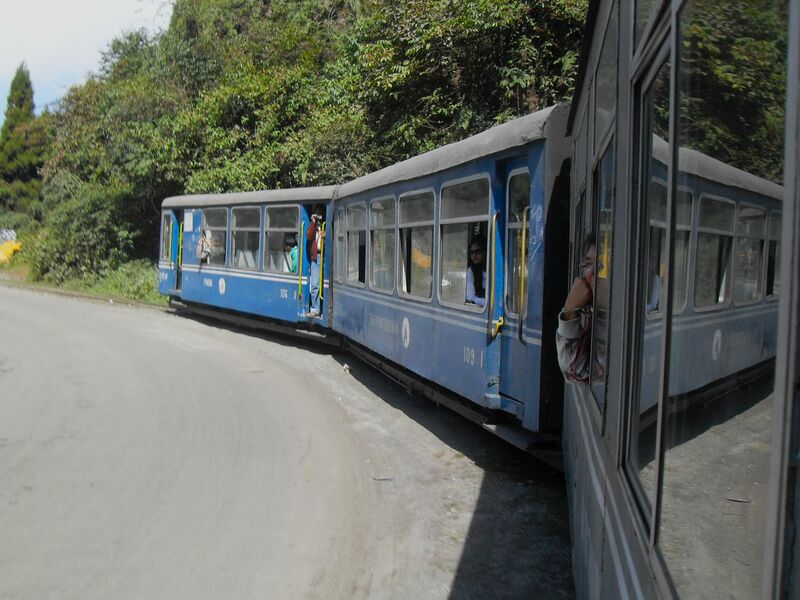 But instead of taking the speedy route of a shared taxi down the hill 32km to Kurseong – our next stop – we opted for a lumbering and hilariously slow train journey instead. At first, we thought it would be a quaint way to travel. It was to take three hours to cover the short distance but – with the turtle-slow traveling – we figured we’d get the chance to enjoy the views down the mountain in a wonderfully relaxed manner and all at the low price of around £3 each for “first class” tickets (this relating to the ancient, dusty seats covered in a carpet-like material that were an upgrade from the wooden benches in “second class”). But, as soon as we boarded, we realised our mistake – we’d forgotten how much people in all parts of India love to use horns. While we’d only experienced this in cars, as it turned out, the same logic goes for trains. That’s right – THREE hours of a blasting, blaring train horn. So much for a laid-back journey! 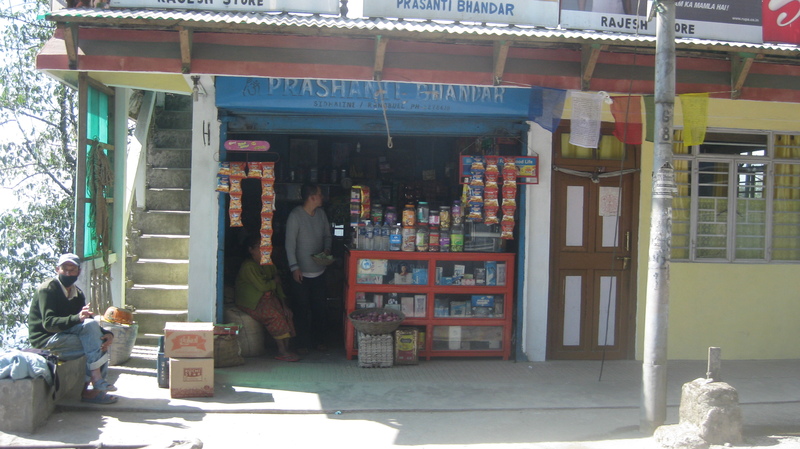 One of the many shops one passes a few feet away from on the Darjeeling-Kurseong route. But, regardless, the trip was incredibly memorable. The old diesel locomotive runs along a frighteningly narrow track that zig-zags back and forth across the main road. This seemed to be the primary reason why the conductor had to blast his horn constantly – to stop distracted drivers plowing into the side of the carriages. When the train wasn’t trailing over the roadway, it mainly traveled alongside it, giving us a good view of the inside of the jeeps that beeped their way past. As we lumbered our way downhill, villagers would come out of their houses to wave at us, while dogs howled at the horn. At times, we passed so close to shops and houses, we could have easily leaned out the window for a packet of crisps or a pair of pants off a laundry line. It was – quite possibly – the oddest journey I have ever taken. 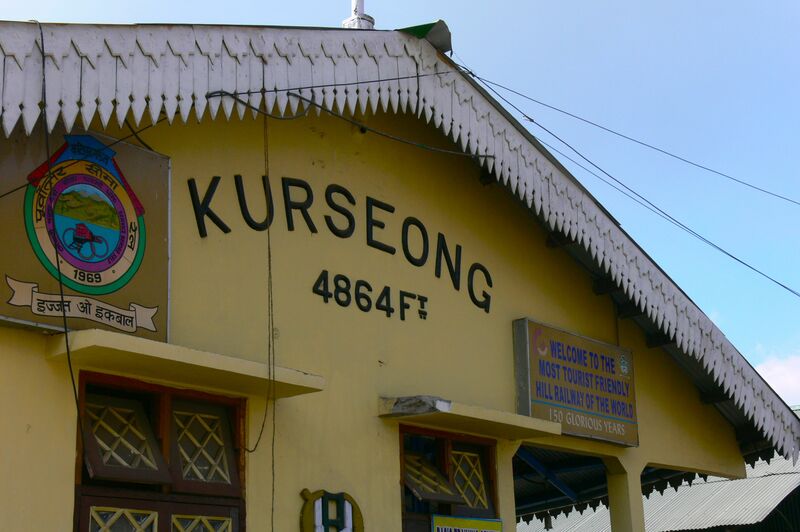 When finally we arrived in Kurseong – which labels itself the “most tourist friendly hill railway in the world” for reasons unbeknownst to the boy and I – we were longing for some peace and quiet. 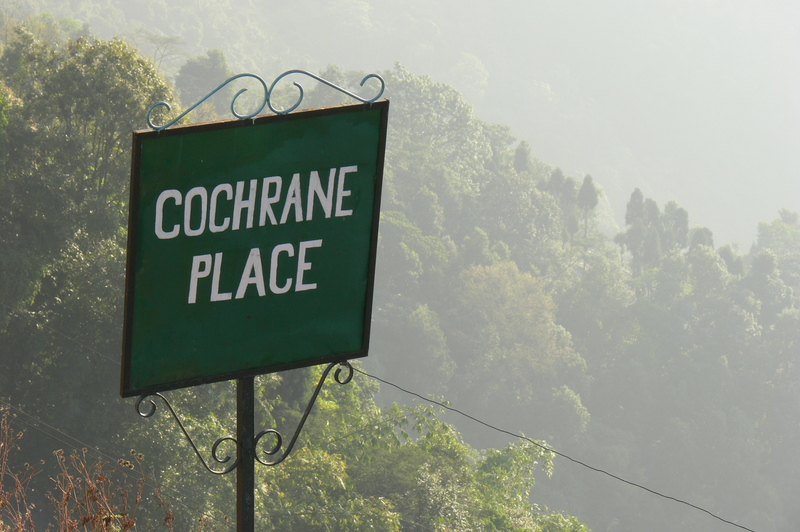 We’d made reservations at Cochrane Place – a hotel on the town’s outskirts. Since we weren’t spending the extra money on a trip up to Sikkim, we thought we’d treat ourselves to a couple of nights of more upscale lodging. The hotel was formerly the home of British colonial Percy John Cochrane who acted as the area’s magistrate in the early 20th century. It has been restored to house a wide variety of individually decorated, slightly ramshackle rooms and has a restaurant on-site, which made for easy dining. At the back of the first floor was our room – am expansive, two-floored deluxe space with lounge, bedroom and a balcony that overlooked nearby houses and mountains. We even had a teddy bear to greet us. 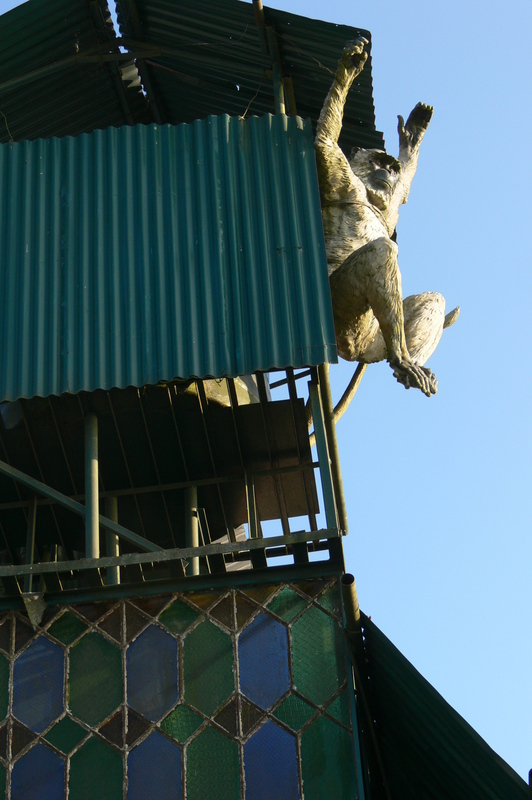 King Kong anyone? Eccentric decor at Cochrane Place. But despite the more upscale space and welcoming soft toy, everything about Cochrane Place felt slightly haunted – from the old abandoned games room, to the colonial pictures on the walls and strange antique dolls in cabinets. And, while at the hotel I can honestly say I experienced something that will haunt me for years to come – a stick massage. Billed by management as a local treatment, I expected a “stick massage” to use, well, sticks, that would likely be rolled up and down my spine or arms to help the masseuse work out tough knots. Given I’d had 10 days of lugging around a heavy backpack, it seemed like just the thing that would relax me. But oh how I was wrong. A stick massage is – quite literally – a massage that uses different shaped wooden instruments that are hit against the skin in a tapping manner to stimulate the nerves. As I lay on the bed, fully clothed, and had sticks rattled against me like a drum for an hour, I realised it probably would have been best to confirm how this massage was done before agreeing to it. I’ve never seen the boy look so happy to have missed out on something than when I regaled him with the tale of being rat-a-tat-tapped for 60 long minutes. 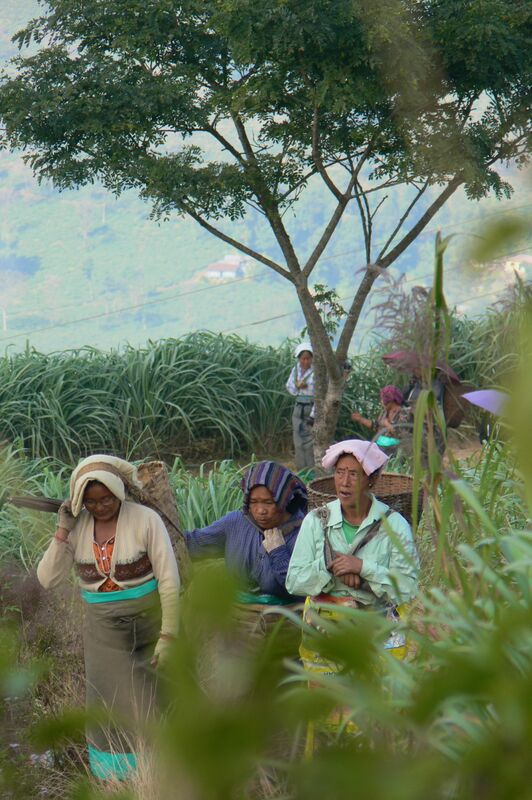 Local tea workers off for lunch. The bizarre nature of Cochrane Place was, however, one of its most charming aspects. We would dine each afternoon and evening with a different group of guests in the large dining room, chatting about our travels and asking them where they had been, while looking out towards the sparkling, lit up hills where thousands of strangers were likely eating their meals in their homes. In the daytime, we trekked around tea estates and up long, winding hills near the hotel. Both it and the train journey will stick with the boy and I for years to come – and, sometimes, that’s what traveling is best for: experiencing the unexpected! In Part 6, the boy and I head south for our last leg around Kerala and fall head over heels for Varkala.